At various times, I have wanted to be something that I am not. Sometimes it’s because I have confused family or social expectations with my own, and sometimes it’s because I see someone who I really like and admire, and want to be just like them. For example, I like trees and want to look after the environment, so I thought I wanted to be a National Parks ranger. Yeah, this is someone who only likes to walk on paths, preferably flat. For example, because I thought my Mum was awesome that she helped people with their health and was so compassionate and caring, I spent 5 years studying massage, nutrition and homeopathy; only to realise/remember that my impatient and acerbic bedside manner and my allergy to assuming responsibility for other people’s problems would make me a poor healer of people. Again, I got confused. I thought that just because I love local, fresh produce, that lots of my friends love to garden, the Bear is a horticulturist, my parents are wonderful gardeners and that I live in the country with plenty of space to have a garden, that meant I should be a gardener. And you would think that because I am not a gardener, have never been a gardener (as a child I would rather clean the house than do anything in the garden), and that I already knew this about myself, that I would have avoided the pitfall of ever thinking that I should be a gardener. Alas. I wanted to have a garden, I wanted to grow my own food, I wanted to cook and eat the food that I grew…but the fact remained that I don’t like to garden. Still, I persisted with this fantasy. I mean look at her. That Garden Goddess is gorgeous don’t you think? 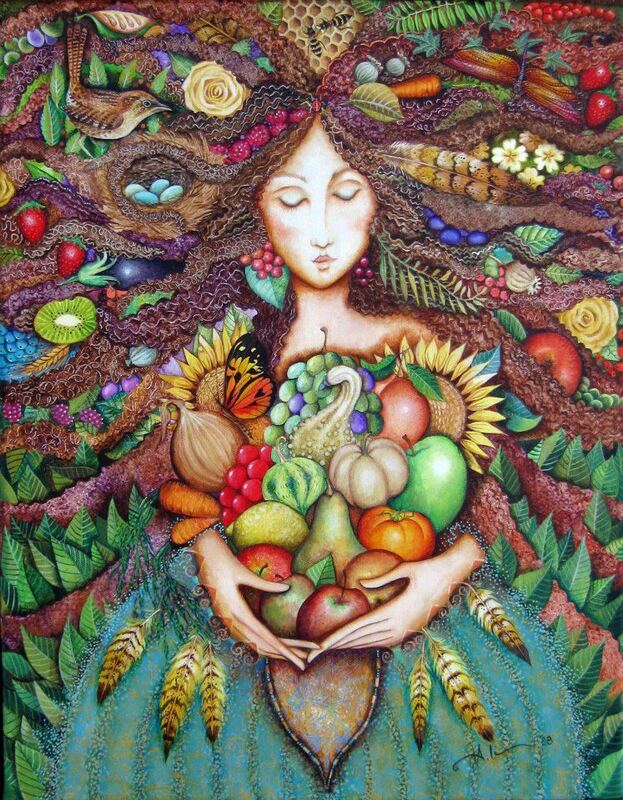 Bounteous, fertile, earthy, mothering, nourishing; actually, now I come to think of it, that could be a description of my mother. Oh damn. Oh dear. Mother fantasies again :). Never mind. The Bear and I must have been on the same wavelength yesterday. I was at one of our valley’s fresh produce markets filling up my bags with glorious produce. Because I was still in denial about my garden abilities, I was feeling a little bit guilty that I was buying all of this produce instead of growing it. At this one stall, the husband and wife team were selling silverbeet, garlic, leeks, shallots, cucumbers, zucchinis, ginger, eggs, herbs, eggplants and more. It was beautiful. And they grew it all themselves! Hard work, yes, but it was a joyous work to them. And it came to me, that these people would not be able to do this work that they loved if there were not people like me to buy it off them. Late that night, when we were talking over our day, I told the Bear about these people, and how beautiful their produce was. He looked at me and he said, the truth is, I don’t like growing food. Collective intake of breath….Yeah, me neither, I said. I wish I did, but I just don’t. So there. It’s out. The Bear is a horticulturist who doesn’t like to grow food, and I am a local food hippie-type…who doesn’t like growing her own food either. Ha! So many of our problems come from thinking that we should be someone different from who we actually are. Free-wheeling nomads who think they should be sensible banker-types. Sensible banker-types who think they should be artists. Career women who think they should be earth-mother types. Earth mother types who think they should be career women. Living our lives like this will literally make us crazy – and feeling shame and guilt because we are not someone that we were never meant to be in the first place is crazy! Don’t you think? This is the thing – we were created for a purpose. And the only way we can fulfil that purpose is to know who we are, be who we are, and do the things that we love. For in that way, we honour our purpose. Have you ever fooled yourself into thinking you were something that you are not? I enjoyed this post. I feel like I do the same thing often – fantasize about what would be cool to be, but I don’t really end up liking to do. It’s interesting that I don’t like growing most types of food either, except for strawberries, because I hardly need to do a thing with them. I also like to grow perennial herbs like thyme, lavender, and sage. When it comes to growing my own food, I like the idea of it, but have never come close to doing it. I’m not sure if I know what type of person that I am, ie. earth mother vs career woman, etc. I have come to believe it’s best to experiment as you’ve been doing and be honest with yourself and discover what you love to do, and not worry too much about fitting in with what other people are better suited to do and be. Yes, I don’t know where I fit in on that scale either – somewhere in the middle I imagine. I am domestic, but freedom-loving 🙂 I too have a herb garden – and I even grow non-perennial herbs like parsley, basil, coriander and oregano 🙂 But sadly, that is the limit of my abilities…you have a great week too! Thank you so much for this incredibly inspiring post! I look the same way in my dreams! You are a delightfully talented writer. Thank you for sharing. This post inspires me to remember and continue to be true to who I really am. And I REALLY want backyard chickens (for eggs) in a city that forbids it, so either I enter into the ‘civil disobedience’ of Thoreau or move. Well, for now, I will continue to buy eggs from vendors in markets who sell free range (happy!) eggs. Your closing poster is amazing. I love Maya Angelou and this is the best poster I’ve seen. A great post all around. Thanks again! Great post, Sara and I completely agree with you. We have to truly know ourselves and what we want, without getting distracted by other people’s expectations, in order to find what we were meant to do. I’m still in the process myself but I’ve learned that just because we like something doesn’t mean we’re meant to be more than just an admirer. 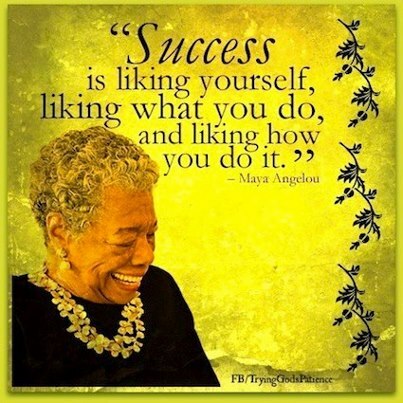 Love that last quote by Maya Angelou. I am still learning myself, and I have a few years on you, if you have just had your 23rd birthday. We are definitely a work in progress, that’s for sure!